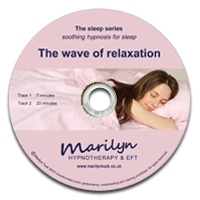 A lovely, soothing wave of relaxation programmed to send you to sleep as soon as you think of your toes. The wave of relaxation gently, soothingly and progressively relaxes you to sleep. This is the cornerstone of all my audios. Hundreds of people have listened to A wave of relaxation as they settle down to sleep and soon found themselves comfortably lulled off into a deep relaxing sleep until morning. It has a nice balancing effect and as such is also helpful for those with chronic pain, and anyone wanting to relax when travelling or having treatment. A wave of relaxation is perfect for all ages from 7 up, and lovely for older people with sleeping problems. Always listen when you are resting as it either sends you off to sleep, or lets you roll over afterwards and go to sleep. If you awaken in the night for any reason use it to relax you back to sleep. Listen at least 5 nights for the first week, 4 for the second week and three for the third, or every night until you sleep peacefully on your own. Ideally do it yourself and let it happen. Come back to A wave of relaxation at any time in the future. For those who are thinkers at night try Powering down. These two in the sleeping series can be alternated with any in the healing series, which also soothe to sleep.